If you are looking for merit stickers to reward good work at school, you’ve come to the right page. Here we offer a range of subject themed stickers that recognise specific areas of effort in school or other learning centres. Brightly coloured Maths Merit stickers for reward or decoration come in packs of 96 stickers. Stickers features include a big yellow star with the words “maths star”, a wizard brewing numbers in his couldron saying “maths wizard”, a calculator character and blackboard saying “cool calculator” and a clown juggling numbers with the slogan “good at numbers”. 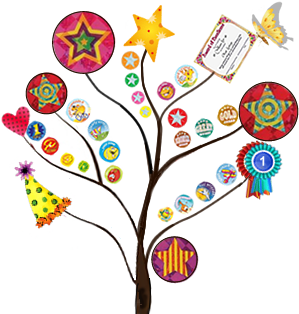 Fabulous Music Merit stickers for school to reward or decorate students’ work come in packs of 96 stickers. These merit stickers include a violins, conductors, guitars, drums and musical notes flying around with slogans such as “groovy”, “brilliant”, “funky” and “beautiful”. Special Principals Award stickers to get involved with the kids come in packs of Pack of 72. There is no doubt that kids receiving a merit award from a Principal will remember it for their whole schooling career, if not lifetime. Make an impact on a kids life with these eye catching, silver glitz on gold foil stickers for school. Merit stickers for rewarding merit in reading classes also come in packs of 96 stickers. These stickers feature fun characters of Aussie nature such as ladybugs, kookaburras, bees and pelicans all enjoying reading with slogans such as “good reading’, “well read”, “I’m a good reader” and “just love reading”. Well Presented Merit stickers for rewarding merit in classes when kids have just finished a nerve-racking presentation in front of the class. They come in packs of 96 stickers and are 29mm across. These well presented stickers come in a range of colours and feature formal and modern award style graphics. Writing Merit stickers for reward or decoration at school in general writing classes feature an attracting flying theme with jet planes, classic planes, helicopters and kites showing slogans such as “well written”, “neat writing”, “creative writing” and “clearly written” – all essential tools in the arsenal of an English teacher trying to develop students abilities in writing. Computing Merit stickers for reward or decoration come in a variety of cool colours featuring sayings such as “Yes, you’ve got it!”, “flash work!”, “computer whiz”, “what an effort!” coming from computers, robots, laptops and electronic mice. Make your school proud with merit stickers for your specific class. Use these brightly coloured Sport Merit Stickers for reward or decoration after sporting events. Kids are still exploring their motoring skills and need your encouragement to try and try again. Science Merit stickers are the perfect partner to experiments gone right! let students know they have done the right thing by testing their thesis with a merit sticker specifically designed for science. They feature test tubes, beakers, green houses and elements of nature using slogans such as “great work”, “brilliant” and “well done”, “excellent”.